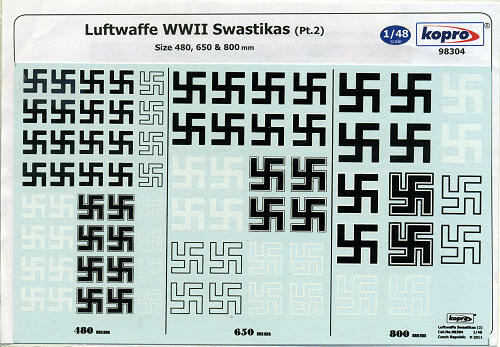 This sheet from Kopro includes the very largest sizes in 1/48. That means 480, 650 and 800 mm sizes. They are offered in a variety of styles including solid black, solid white, black outline, white outline and black with a white border. There is a conversion chart on the back of the info card that provides dimensions in both inches and millimeters. While it would have been nice to have a chart stating which aircraft normally carried which size, apparently it was felt that there were so many variations as to make such a chart less than useful. Still, I would have liked to have seen one.